"Kyoto Marathon 2018" took place on February 18, in Kyoto City. The marathon was hosted by Kyoto City Government and Japan Association of Athletics Federation Kyoto, in cooperation with Kyoto City Gymnastics Association, the Kyoto Shimbun and other organizations. Approximately 16,000 participants in the marathon, including the Pair-Ekiden, or a relay race, and the Wheelchair race, ran though the ancient capital in its early spring. 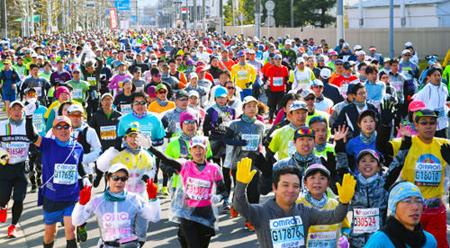 Having begun in 2012, Kyoto Marathon is now in its seventh year. At the starting time, 9:00 a.m., in Nishikyogoku Athletic Stadium, Ukyo Ward, it was cold with a temperature of 6.7 degrees Celsius, or 4.3 degrees lower than last year, when the starting pistol was fired. Participants ran beside famous sites with a rich history, such as Ninna-ji Temple and Kyoto Gyoen National Garden, as well as along the banks of the Kamo River, striving to reach the goal in front of Heian Jingu Shrine, Sakyo Ward. There were 15,343 finishers. According to the organizers, about 530,000 spectators enthusiastically cheered runners from the roadsides.